My daughter adores fried tofu with peanut sauce. With a side of steamed broccoli, it's a nice dinner to fall back on when nothing's been planned or prepped. Though it takes a bit of time — 10 to 15 minutes — to fry the tofu, everything else comes together quickly. Prep the tofu: Use paper towels to pat the tofu block dry. Cut the block into 4 strips lengthwise, then cut into cubes. Blot with paper towels again, to remove any moisture from the surface. Fry the tofu: In a large skillet, pour enough oil to come up in the pan a quarter-inch. Heat the oil over medium-high heat. Once the oil is hot, add the tofu cubes carefully, as the oil will sputter. Fry the tofu until golden brown, turning to brown all the sides, about 10 to 15 minutes. Don't overcook; you want the tofu to be crisp on the outside, but creamy on the inside. Drain the tofu on paper towels and sprinkle with salt. Prep the peanut sauce: While the tofu is frying, put the peanut butter, soy sauce, chile-garlic sauce, lime juice or vinegar, and brown sugar into a medium bowl. Whisk together, pouring in the warm water, until smooth. 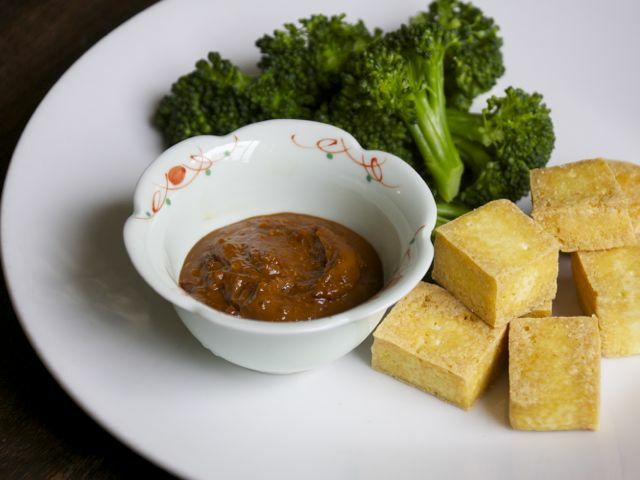 Serve the fried tofu with the peanut sauce and the steamed broccoli, if using.